It was decades ago when Louise Hay opened the floodgates to the world of alternative healing with You Can Heal Your Life. Now that those seeds have come into full blossom, it seems natural that she would be the one to move it all up to the next level. The science of wellness, including cutting-edge nutrition and lifestyle changes, is at the tipping point. Even recent PBS pledge drives were weighted heavily with programs about eating to improve health and happiness. Almost everyone in this country must now be aware that the high calorie/low nutrient diet most Americans subscribe to is a death sentence. Yet change is difficult — UNLESS — you become engaged by the bigger picture. The BIGGER PICTURE is exactly what Louise Hay is delivering … and the BIGGER PICTURE is LOVE! From “we learn to paint the picture we want other people to see” to putting “healthy-food time” on your daily calendar to the metaphysical meaning of poop, Louise Hay is moving the issues of obesity and self-destructive behavior into the spiritual realm. At that level there are only two choices: love and fear. With this groundbreaking book, she is telling readers how to embrace love first and let healthy lifestyle choices fall into place afterwards. She has chosen two associates who are experts in nutrition and wellness practice to fill in the details. They have done a superb job of that. Once the information is solidly in place, Louise Hay puts it all into context, explaining how easy it can be to let go of fear and choose love once we have decided to do that. In case you have now become afraid that this is a mood-altering, motivational tome delivered from the mountain top and just out of reach, be assured that this book contains solid physical plane facts and lots of them. Cutting-edge nutrition, which is suddenly cropping up everywhere you look, is covered thoroughly in highly readable discussions. The book itself is extremely well-organized making it a valuable resource tool on many levels. My favorite section is the recipes at the end. Loaded with snacks and desserts in addition to the basics, these recipes are appealing as well as nutritious. This week brings a carefree tone that many of you have been missing for months. Trust the universe that the good news will continue and don’t worry yourself back under a cloud. Work will be required but it will flow easily and bring a solid sense of accomplishment. Enjoy. MESSAGE FROM THE GUIDES follows this review! This spellbinding metaphysical adventure tale takes us to the heart of ancient Egypt and a celestial “wormhole” in the Valley of the Kings. The astral portal opens up to reveal twelve distinct pathways, presumably used by the transitioning pharaohs as they made their way to the upper realms and the company of “The Shining Ones”. Pearce quickly recognizes the pathways as part of a larger initiation process, and twelve Angels of Atlantis appear before him. As this astral journey continues, each of the twelve angels reveals the esoteric wisdom of their special pathway. The teachings not only offer help for the physical plane, but also guide the seeker through the associated initiation process. Pearce’s intense narrative creates the illusion that one is watching his adventure as if it were a full-color movie. Guided meditations are included throughout and each of the twelve encounters is illustrated with one of Richard Crookes fabulous drawings from the Angel Heart Sigils of Atlantis card deck. 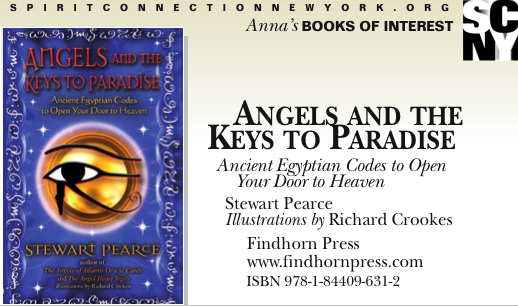 Whether you’re interested in angelic communication and ascension theory or not, this is an exciting read filled with lots of information about ancient Egypt, diverse spiritual traditions, and energy based healing systems. A new week begins and major life changes begin with it. Let the universe work its magic. You won’t be disappointed. Don’t hang on to the past. Move forward with your eye on new opportunities and new ideas. Celebrate! Chad Wallace has created both an exciting, educational adventure and the endearing little critter with big brown eyes who is the adventurer. 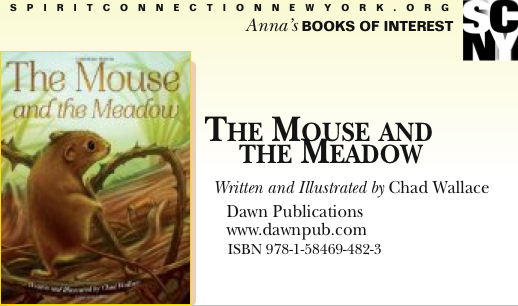 His little meadow mouse leaves “the comfort of his mother’s nest” to explore his teeming world from its “tangled reeds” to its “flowers, leaves, and weeds” to “a patch of rotting wood”. Along the way he talks to insects, mistakes a box turtle for a rock, is saved from a snake by a weasel, is comforted by a rabbit, and is rescued by an equally endearing little female mouse with whom he chats profoundly under a full moon, ending the book on a happy note and with a question mark. Wallace has used this opportunity to transit into the world of electronic art. He created the illustrations digitally and prepared the book for both print and ebook production. In addition he helped create the amazing new pop-up app that Dawn Publications is offering to readers FREE. Loaded onto an Apple or Android mobile device the app (available at iTunes App Store, Amazon App Store, or Google Play) makes the book 3-D, with animation and narration. The magical experience made this jaded adult smile with delight. The week ahead is much brighter — literally and figuratively. Take a deep breath and relax your shoulders. You’re moving forward with a lighter load. Reflect that in your demeanor and you will magnify the benefits. Here’s a great book about Past Life Regression AND it comes with a chance to get free CD’s! At a very young age Lorraine Flaherty began asking questions which the adults in her life, and in her parents’ mainstream religion-of-choice, couldn’t answer. She started searching for answers in alternative spiritual philosophies and soon discovered the esoteric traditions contained within many of those philosophies. Turning her back on a potentially successful acting career, she focused instead on Neuro Linguistic Programming and Clinical Hypnosis. Her work as a clinical hypnotherapist naturally led her to explore past life regression and she was hooked. Past Life Healing became a guiding star of her career. This book is a natural outgrowth of her work. Writing clearly, with no ethereal trappings added for effect, she covers all the basics of past life regression, including soul groups, synchronicity, spirit attachments, releasing karma, and uncovering your life’s purpose. Accounts of her client’s past life work illustrate her discussions and the well-thought-out exercises she offers readers are clearly explained and easy to follow. If you’re interested in past life regression and its use in healing, this is the place to begin or continue your studies. 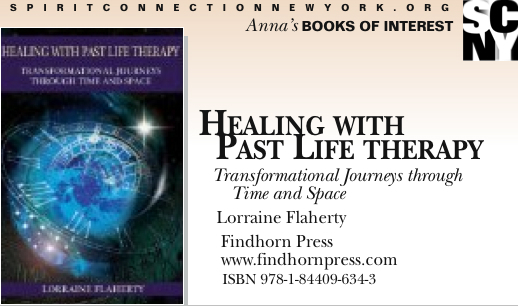 An added bonus: Flaherty’s second CD set (Inner Freedom II) includes both past life and future life guided meditations. I’ve listened to them and they’re great. There will be lots of activity this week. Results will be achieved and stalled ventures will be launched. Show up (as they say in AA) or you’ll miss the rewards. You may be really tired but this is not the week to take a break. Can you really heal yourself? Louise Hay believes you can. For over three decades she has been publicly affirming that belief, creating a multi-national business along the way. 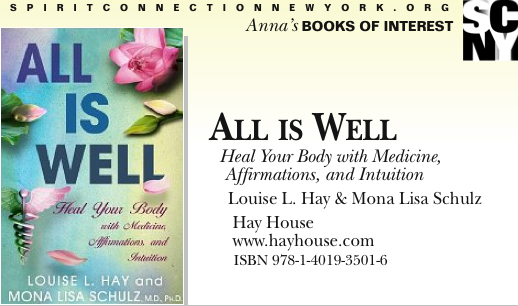 Now Dr. Mona Schulz provides an updated review of Louise Hay’s famous practical-yet-intuitive concepts and adds a medically anchored, scientific foundation to the mix. The result is an exciting new synthesis of science and metaphysics — truly a match made in heaven. The book is organized around seven emotional centers (some readers will recognize the chakra system) and the organs/body systems associated with those centers. Information about each center is merged with affirmations and case studies to help readers find their own way to the healing insights which will be of most value to them. Fans of Louise Hay will enjoy the expanded perspective of this refresher course. 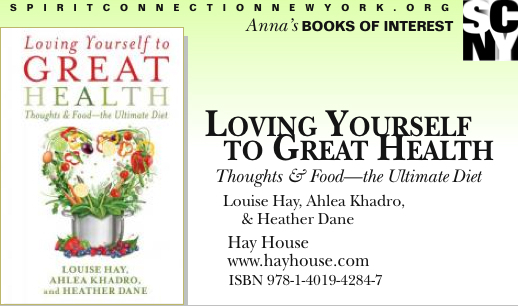 Readers new to Hay’s ideas will find an easily accessible path through Hay’s beloved self-healing protocol. There is truly magic on these pages, a magic known as LOVE. It has been a one-step-forward-two-steps-back spring. When the universe is stirring the pot, there’s no point in swimming against the tide. Better to use the time to thoroughly scrutinize what floats to the top. Try thinking of it as a once-in-a-lifetime opportunity to bring deeply buried memories and beliefs into the light. Coincidently, the universe sent me a book with new ideas about how to do just that. 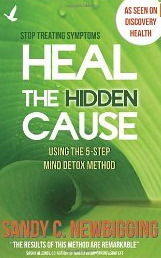 Heal the Hidden Cause by Sandy Newbigging. I read (have read) a lot of books about healing. This one takes a new approach, moving the discovery/releasing process onto the fast track. It doesn’t release until May 1, but you can pre-order it on Amazon. Back to work — big time. Much that was put on hold will release this week. Be ready to move quickly. Big career gains are possible. Don’t get caught napping. Personal relationships are highlighted as well. Organize your calendar in order to maximize your time!